All you whole grain fans, I just learned that you can use a rice cooker to prepare all of your favorite grains. You may have already known about this great tip but, I have been known to be a "day late and a dollar short." I really was not aware that you could cook grains other than rice in a rice cooker! I had a rice cooker for several years. My daughter-in-law, Stephanie, gave me hers when she first got married. She said, "I don't need to make this much rice." I told her I would take it off her hands if she would take it back when she did start needing to make larger quantities of rice. Sure enough, four years down the road and she was happy to take it back. I originally learned to make rice on the stove top and I pretty much have stuck to that tradition. 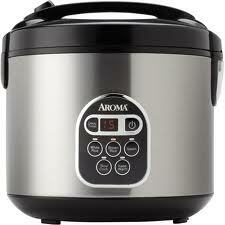 Sure, I can live without a rice cooker, after all it is just another appliance to take up space or so I thought. Then I realized that a rice cooker frees up the stove top and I love the idea of being able to cook all my grains in it. SOLD!! One of the things you can do to cook your whole grains faster is to soak them for at least 20 minutes before putting them in your rice cooker. But, if you are like me, I generally forget to take that step. Never fear, the rice cooker will still get them done. The rice cooker continues to cook until all the liquid is absorbed and even when the rice cooker switches over to warming mode it continues to cook. Some rice cookers are very basic, they have an "on" switch and then they switch over to warming mode, while others have an additional setting for brown rice. Obviously, I can't tell you how your rice cooker works. I would just say, "If you can't cook whole grains in your rice cooker you may want to think about getting a new one." I often make extra rice and use it for another meal. This is also is true with quinoa and many other grains. Quinoa is a grain that is often added to dishes and even sprinkled on salads. Having some made ahead is a great idea! Even hot dishes such as chili can have a cupful of quinoa added to the dish to give it even more protein or to stretch the serving amount. Using a rice cooker can certainly shorten your time in the kitchen and can help make more nutrient-dense meals. Like I said, I'm SOLD! Rinse quinoa in cold water. Put quinoa into the rice cooker. Add liquid and salt. Turn on the rice cooker and when the machine beeps, the quinoa is done. Cook quinoa according to package instructions. Let cool. In a large bowl, combine the quinoa and the fruit. In a separate bowl whisk the lemon and honey together. Pour over salad. Lightly toss.